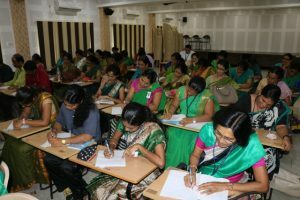 Staff enrichment programme – ‘Handwriting Is Mind Writing’ was organised by Lourdes Central School on 7th July 2017 at 2.15pm in the A V Room. Mr Roshan Cordeiro welcomed the Guest Speaker Mr Edwin Stany D’Souza, the Principal Rev. Fr Robert D’Souza, the Vice Principal Mrs Belita Mascarenhas and the staff. Mr Stany D’Souza began the session by distributing A4 sheets to the staff and dictated a paragraph to write. He said in a population of 126 crore in India, no single handwriting is the same; it is unique, special and has to be respected. “Writing is a neuromuscular act. Research shows that certain neuromuscular movement tendencies are associated with a specific observable personality. The changes recommended are based on research related to what part of the brain, a particular letter formation involves. Though the rule is that the brain trains the fingers what to write, through graphology, the brain is trained through fingers” he says. Size, space in between words, slants, loops, dots, margin left and utilisation of the page are some of the criteria considered while analysing handwriting. A person with right slant is considered to be an extrovert but the one with left slant is an introvert. The placement of dot (as in the letter ‘i’) shows focus of the person. Mr D’Souza says every word is like a human body. It is divided into three parts. The top part represents the philosophical nature, ideas, beliefs and self motivating ability. The lower portion stands for imagination, creativity, physical and sexual drive while the middle zone stands for present state of mind of the personal and balancing act between upper and lower portion. Children of Kindergarten are given a four lined book to write to balance the zone ie for rhythm and harmony. Signature is sign plus nature. It gives the impression, identity, consent and persona to the world. Looking at signature one can know the behaviour. Behaviour is formed with VAKOG system: V – Visual, A – Auditory, K – Kinaesthetic, O – Olfactory, G – Gustatory. “ Handwriting reveals the real you. It is the true map of a person’s character, feelings and state of health. It is an exterior manifestation of something more than human thoughts. Scientific changes in handwriting brings positive changes in life” assures Mr D’Souza who says that apart from the people who have been trained under him, he personally had great benefits from adopting certain changes in handwriting. He thanked the Principal for giving him an opportunity to share about hand writing, his ideas and thoughts. Vote of thanks was delivered by Ms Deepika. She thanked the Guest Speaker Mr Stany D’Souza, the Principal, the Vice Principal and the entire staff. Ms Suchita Monteiro and Ms Gretta Menezes were in charge of the programme.